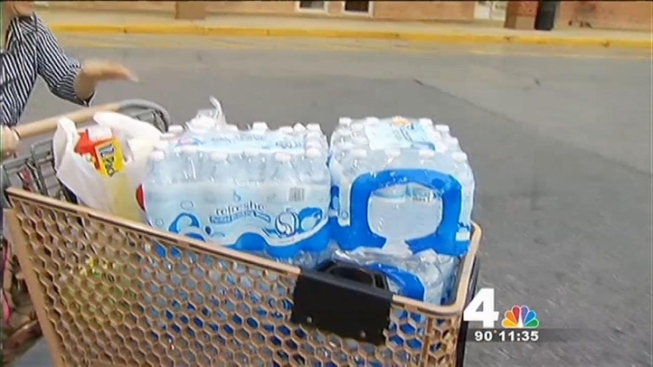 Two local radio stations and a grocery store gave back to the community Wednesday by handing out water and providing Prince George's County residents facing the threat of a water outage a place to shower. WPGC 95.5 spent the morning handing out water at the Safeway in the Rivertowne Commons shopping center in Oxon Hill. The station said they would be there until crews completed work on the failing water main. Residents hoping to receive water are asked to bring IDs. "You know, I like to go ahead and do the honesty system, where if you don't need it, why try to get something for free. We're trying to help people out, like the elderly, also people with families...But we'd like to see an ID, so we can match a face to the face," Pablo of The Pablo Show said. "Yeah, no, we're checking IDs," his co-host, Tati, responded. "We want to make sure the people affected by this are the ones getting the water." Wednesday afternoon, Jerry Johnson, the general manager of the Washington Suburban Sanitary Commission announced that an outage may not occur if residents continued to adhere to water restrictions. Meanwhile, Hot 99.5 booked several hotel rooms in the county, so people could take showers. Intern John of The KANE Show said, "All day listeners have been taking showers before work." Safeway also announced plans to distribute nearly 5,000 gallons of drinking water to those living in underserved portions of Prince George's County. Distribution began at 10 a.m. Wednesday at the MNCPPC’s Southern Regional Technology and Recreation Complex, located at 7007 Bock Rd. in Ft. Washington. At 1:30 p.m., water was still being given away despite the news that the threat of an outage had largely been averted, News4 Prince George's Bureau reporter Zachary Kiesch reported. Kiesch added that most in attendance didn't seem aware of the new development. A second distribution scheduled to begin at 6:30 p.m. at the Community of Hope AME Church at 3701 Branch Ave. in Hillcrest Heights was canceled after the WSSC announcement. Prince George's County also gave out water at three distribution centers from noon until 9 p.m. Wednesday. Residents also were able to cool off and take showers at several reception centers. County Executive Rushern Baker said distribution centers and reception centers opened Wednesday would be shut down at 9 p.m. The county also opened a number of cooling centers. Baker said operations and services set up for the shortage would continue for 24 hours as a precaution.